Video Cards, also called display adapters, have an important role in a gaming computer. They have the important job of displaying all the vibrant colors, textures, and shapes to your monitor for your viewing pleasure. Video card technology advances very frequently and staying atop the latest technology is critical. The latest video cards feature dual monitor outputs, faster bandwidth and more memory built into the card. This article will explain the many terms and features associated with modern video cards. Video cards use the special PCI Express (PCIe for short) slot in the motherboard. As an improvement to the dated Accelerated Graphics Port (AGP) technology, the PCI Express slot on the motherboard was designed to allow very fast transfer of data to the CPU. You'd be hard pressed to find a video card that still uses the AGP slot as almost all modern cards utilize the benefits of PCIe. Over the years, there have been some updates to the PCIe specification. The very latest is 3.0, however, the 2.0 and 2.1 series still dominates the marketplace for the time being. Video cards use a special type of memory called Graphics DDR (double data rate) memory or GDDR for short. Without getting overly technical, the GDDR memory is used to handle all the colors and object details produced by modern computer games. The more memory available for the video card to use results in faster gaming performance. There have been several advancments in video card memory over the years and the latest is called GDDR5. For modern games, such as Call of Duty: Modern Warfare 3 or Crysis 2, 896 MB of GDDR5 memory will more than handle the highest graphics requirements. However, having extra memory with your video card is never a bad thing and a great way to prepare for future games yet to be released. Video card memory is also categorized by it's bandwidth and is measured in GB/s (Gigabytes per second). The bandwidth is essentially the speed of the RAM in the card and the higher the bandwidth a video card has corresponds to better gaming performance. The latest GDDR5 memory features a bandwidth of 130-230 GB/s. The latest video cards on the market feature several different output connectors. The most common of these is the DVI (Digital Visual Interface) output, which uses a special cable that has a white connector at the end. The digital signal used by DVI has replaced the older analog signal used by the VGA technology. Used for quite some time is the 15-pin blue VGA (Video Graphics Array) connector. Most, if not all, CRT monitors and early LCD monitors used the VGA cable to transfer the video card output to the monitor. It was limited by its analog signal and has since be vastly replaced by both DVI and HDMI. HDMI (High Definition Multimedia Interface) is another very popular output connector. It allows for the highest possible resolution provided your monitor can handle it. HDMI cables are unique in that the cable carries both audio and video signals. Many newer video cards include an HDMI output along with a DVI output as well. Many video cards feature two DVI output connectors enabling you to use multiple monitors with your computer. You can use the monitors in several different ways. One way is to display the same image on both. Another possibility is to extend your desktop across both monitors, which allows you to surf the web on one monitor and watch a movie or the other for example. There are two main competitors in the video card marketplace, they are NVIDIA and AMD (AMD bought ATI a few years ago). Each has produced quality graphics cards for years and they continue to innovate, bringing the latest technology in their most recent offerings. For more information on the latest video cards available, please see our 2013 Video Card Buying Guide. Also worth mentioning is the technology that uses the output capabilities of two video cards into one output signal. This is called SLI (Scalable Link Interface) and Crossfire modes. Both are proprietary with NVIDIA in charge of SLI and AMD owning Crossfire. The basic idea is to install two video cards into your computer and link them together with a special cable. However, there are some requirements that must be satisfied before you can just start using the Crossfire or SLI technology. First, and most importantly, your motherboard must have two PCIe slots to install the two graphic cards. Also, the two video cards need to be of the same chipset manufacturer, both NVIDIA or both AMD but not one of each. You can't use one NVIDIA card and one AMD card together in Crossfire or SLI mode, it simply will not work. Worth noting however, if you have an NVIDIA based graphic card and a motherboard that supports Crossfire technology, there is no need to worry. The only concern for matching graphic card producer is if you plan on using Crossfire or SLI. The last requirement is your power supply's wattage. Using two video cards requires more power. A power supply of 550 Watts would produce more than enough to power a single card in a gaming computer, it would not however, be enough to power both cards at the same time. That would require a power supply in the 800 to 1000 Watt range for using Crossfire or SLI. Combining two video cards to one output is very useful because rather than paying around $500 for the latest video card on the market, you can buy two of the previous generation's models and link them together and get a comparable output to one of the latest generation's video cards. It is a great way to save some money without sacrificing gaming performance. Video cards are very important to the gaming performance of a computer. Along with the CPU and memory, the graphic cards card highly dictates the frame rate and overall smoothness of gameplay with the latest games on the market. While some of the prices of the latest cards might come as a shock, take solace in the fact that you can purchase a few of the earlier generation's cards and hook them up in Crossfire or SLI mode and get the same result. This is a great way to save money and still enjoy your favorite games. The screenshot above was taken from Modern Warfare 3. Don't be left behind, choose a good gaming video card and start enjoying the latest games at their highest settings! 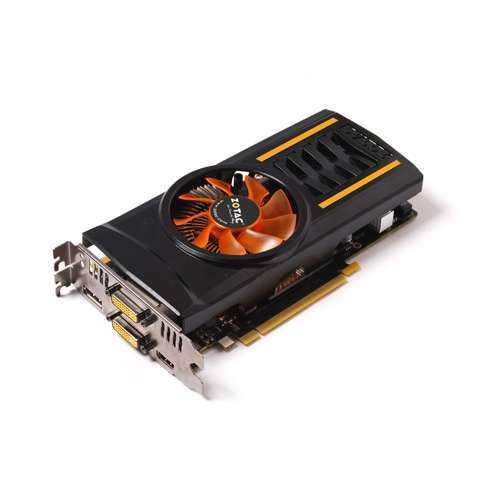 For a vast selection on video cards at great prices, check out www.TigerDirect.com.